HomeTime to go shopping for a UVC system? Time to go shopping for a UVC system? It is great to see the long-awaited ‘Benefits of Terminal Room Disinfection’ (BETR-D) randomised controlled trial of a UVC automated room decon (ARD) system published, in the Lancet, no less! This study firms up the importance of environmental contamination in transmission, and demonstrates additional benefit of UVC over and above enhanced conventional methods for VRE, maybe for MRSA, but not for C. difficile. WARNING: this is a bit of a monster-blog. I strongly recommend that you don’t bother reading this, but do read and absorb the study in detail! There’s now a compelling group of studies showing that admission to a room previously occupied by a patient with an MDRO increases the risk of acquisition for the incoming occupant. Two previous studies have cemented this epidemiological association by showing that improving standards of hygiene at the time of patient discharge (one using conventional methods, and one using HPV) mitigates this increased risk. So, here we have a third study showing that doing a better job of terminal disinfection improves patient outcomes. Anybody care to argue with me that the environment isn’t important in transmission?? Related to this, I note with mild amazement that the accompanying editorial starts with: ‘Acquisition of these organisms [MDROs and C. difficile] through environmental exposure in the hospital has long been recognised as a primary source of infection’. I think this should really read ‘Acquisition of these organisms [MDROs and C. difficile] through environmental exposure in the hospital has been considered negligible or at most a very minor primary source of infection by the expert medical community until very recently’!! Each of the hospitals in the study performed a randomised sequence these four strategies in 7 month blocks. Extreme lengths were gone to (and I have chosen ‘extreme’ carefully!) to standardise and improve procedures. This included the provision of new equipment and an extensive training programme for cleaners. Rates of hand hygiene compliance, cleaning performance (using a pH-based system that is new to me, and sounds promising, and the more conventional UV-fluorescent markers), and colonisation pressure were measured as potential confounders. A composite acquisition rate was the primary outcome (including MRSA, VRE, C. difficile, and MDR Acinetobacter). The acquisition rate for each of these pathogens was also measured individually. The definition of acquisition required the same species of bacteria to be acquired in the incoming occupant, although molecular typing was not performed. Any patient known to have the target pathogen in question in the past 12 months was not considered at-risk for acquisition. I am going to focus on the results for the per-protocol analysis, which I think is the best measure of the impact of the four different strategies (a good number of patients in the intent-to-treat population who didn’t make it to the per-protocol population; for example, 38% (4067/10616) of patients who should have received UV did not). The composite infection rate significantly reduced by 31% when UV was added to QAC (relative risk [RR] 0.69, confidence interval [CI] 0.50 to 0.95), p=0.025). The effect was more pronounced for VRE than for MRSA, and there was no reduction in C. difficile (see Fig 1). Curiously though, there was no significant improvement in outcomes when UV was added to bleach (RR 1.0, CI 0.81 to 1.23, p=1.00). However, when rooms occupied by patients with C. difficile were removed from the analysis, the bleach + UV arm became statistically significant (18%* reduction) (you have to dig into the appendix to find the numbers here…RR 0.82, CI 0.67 to 0.998, p=0.048). The composite infection rate in the bleach arm was significantly lower (26%) than the QAC arm (RR 0.74, CI 0.61 to 0.91, p=0.004), but this significant difference disappeared when the C. difficle patients were remove; this makes sense because why would you expect a sporicidal agent to have an improved clinical outcome when no spores are around? Figure 1. Unadjusted acquisition rates in the four study arms. The team did the appropriate statistical analysis to account for a host of patient-level variables, but I found plotting the unadjusted rates helpful! * = statistically significant reduction in the per-protocol analysis. ** = statistically significant when rooms occupied by patients with C. difficile removed from the analysis. The team also took microbiological cultures from 92 rooms after the disinfection strategy had been executed. The micro cultures broadly supported the clinical findings, with the most reduction achieved for VRE, followed by MRSA, and not a great deal of impact for C. difficile (see Fig 2). Figure 2. The mean number of CFUs detected in rooms in the four study arms; approximately 100 rooms were samples after the disinfection strategy had been executed. Reassuringly, there was very little increase in room turnaround time for the UV arms (around 10 minutes), and there was no measurable impact on patient flows from the ED to the hospital wards. As the post by my fellow-blogger Marc Bonten pointed out earlier in the week, the paper is dense, to say the least. I have had to read it multiple times (including the appendix) to get my head around it. There is a tendency, I think, for big journals to only publish simple, clean RCTs (with few exclusions etc). So it is great to see a big journal like the Lancet having the appetitive for a really pragmatic, gnarly, RCT! This study is probably only looking at around 20% of patients, because it reports outcomes only for patients admitted to rooms where the previous occupant was on contact precautions. 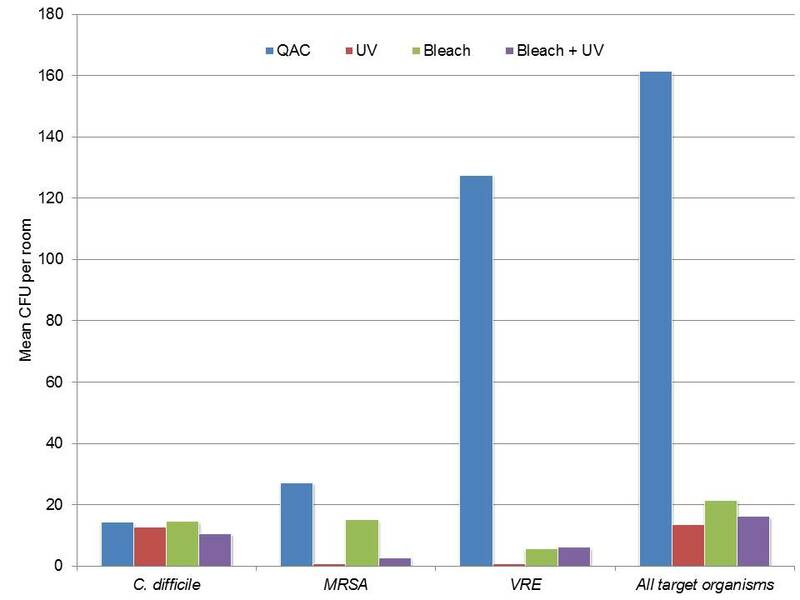 Hospital level changes in the target organisms are reported graphically right at the end of the appendix, and there does seem to be a marked reduction in the QAC vs. QAC + UV arm. It would have been good to have seen more on hospital-level changes in patient outcomes. This is not the real world. I don’t want to take anything away from the investigators here, who have done a fabulous job. But they are a victim of their own success in some ways. The very, very high levels of compliance with standard methods (>90% compliance with cleaning thoroughness is just about the highest level I have seen published anywhere) makes this study pretty unrepresentative of your typical hospital. This could be really important in the context of UV and to a lesser extent bleach. Could it be that part of the effectiveness of more powerful disinfectants such as bleach is covering, to a degree, deficiencies in the manual cleaning process? If you have a small splash of bleach on a surface, it will do better than a small splash of QAC. But a flood of QAC will have the same impact (on vegetative organisms) as a flood of bleach. Similarly, UVC is probably most effective when manual cleaning methods are at their worst! Trying to tease this out in a study is a bit of a catch 22. To get the answer you’d have to implement UV in the real world, with low compliance standard methods. But this would introduce a great deal of variability into the study. Answers on a postcard for this one. Related to this, the improvements effected in standard cleaning and disinfection are a study in themselves. The powering calculations from the baseline acquisition rates were confounded by a much lower acquisition rate in the control group. On the other hand though, showing that hand hygiene compliance, room cleaning compliance, and colonisation pressure did not vary across the four arms is a great strength of the study – and this may not have been the case if these variables were not standardised so carefully before the study began. The environmental sampling data isn’t exactly comprehensive – it would have been great if they had taken a culture in each of the rooms after terminal disinfection, and typed any organisms obtained to match with acquired isolates. Still, the fact that the trends in the environmental sampling data matched the clinical outcomes is a strength of the study. The primary outcome analysis suggests that there is no difference between the QAC reference group and the bleach + UV, but that there was a significant difference after excluding patients admitted to difficile rooms. Also, there was no significant difference between bleach alone vs. bleach + UV. 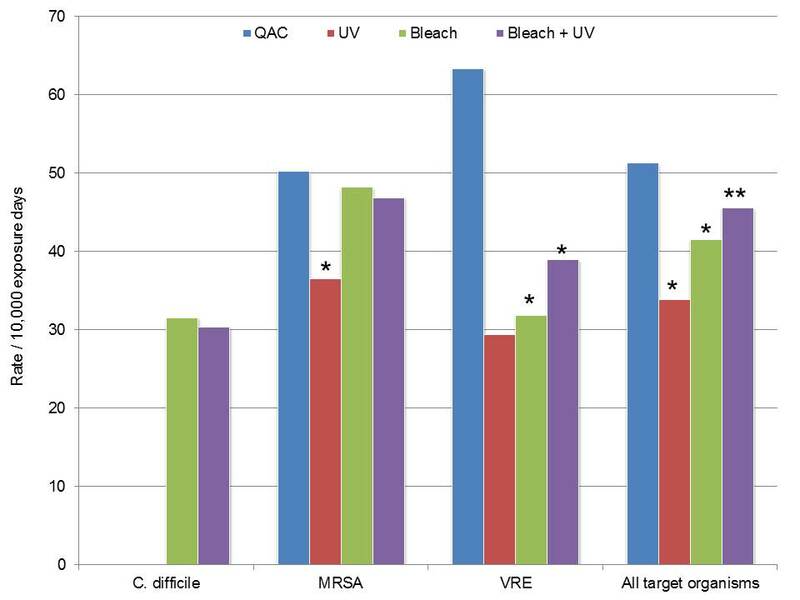 Taken together, this suggests that UV added no additional benefit to high-quality QAC or bleach disinfection in preventing C. difficile. This is in contrast to other studies, some of which are reasonably robust and seem to suggest a clinical impact of UV terminal disinfection on C. difficile acquisition. There are a number of plausible explanations for this finding. Option 1: UV really isn’t as effective as other studies suggest for tackling difficile, and it took a study of this magnitude with a high-compliance bleach comparator to demonstrate this. This option is borne out by the environmental sampling results (see Figure 2), and fits in with lab testing data, showing that UV is least effective against C. difficle spores. The appendix includes a justification for the cycles chosen to address C. difficile, with the rationale that ‘a >2 log reduction of shadowed areas would be clinically effective’…perhaps not! This seems to be the most likely explanation to me. Option 2: There could be operational explanations. The protocol for using UV in this study was a single cycle in the patient room (and not in the bathroom, which is likely to be a hotspot for difficile contamination). The main outcomes remind me of a similar study (that I was involved with) evaluating the clinical impact of HPV. In this study, patients admitted to rooms decontaminated using HPV were significantly less likely to acquire an MDRO or difficile compared with patients admitted to rooms disinfected using QAC, when the prior room occupant was on contact precautions. Although the impact was not individually significant for C. difficile acquisition, there was a non-significant 51% reduction in the rate of acquisition – and other convincing studies have shown that HPV (a very effective sporicide) reduces the rate of C. difficile infection. A couple of key points about UV usage come through in the appendix. A whopping 70% (15,295/21,844) (yep seventy percent) of UV deployments were not actually indicated! There are a number of reasons for this, mainly patients who were on contact precautions that shouldn’t have been (or for reasons other than the target organisms in this study), but also I suspect that people went a bit mad for UV and used it whenever possible “just in case”! Interesting also to note that the median UV cycle time was more than 30 minutes, and even the vegetative cycle had a median length of 30 mins. And yet the increase in room turnaround time was only around 10 mins. Perhaps this is due to less thorough cleaning prior to UV? There is something bothering me about using exposure days as the denominator for the patient acquisition outcome. Some previous evidence suggests that, as you would expect, the increased risk from the prior room occupant diminishes over time. So, could it be that long-stay patients who acquire a target organism late in their stay, which is less likely to be unrelated to the previous room occupant, are confusing the picture? One way of addressing this would be a sensitivity analysis with the LOS of incoming patients censored at around 7 days to take these long-stay patients out of the analysis. I accept that this would further reduce the powering of the study, but perhaps worth doing. All things considered, it is a great study, and I enjoyed reading it. Huge congratulations to the study team for taking this on – and delivering such important findings. But where does this leave us in terms of specifying our hospital disinfection strategy? For me, this strengthens my view that the ultimate approach to hospital disinfection would be carefully optimised daily and terminal disinfection of rooms using a regular hospital disinfectant (or possibly even a detergent), and an HPV/UV ‘hybrid’ approach to terminal disinfection for patients known to be infected or colonised with MDROs or C. difficile. C. difficile terminal disinfection should be the domain of HPV, plus a couple of other scenarios, and for everything else: UV. * Thanks to some sharp readers for pointing out that the original 28% should have been 18%. I saw the RR of 0.82 and somehow that became an 28% reduction in my head. JAO 20/03/2017. Thank’s for this @jonotter, fantastic to see a great study. I now have some bedtime reading. Proper terminal cleaning is the most important to eradicate the bugs in a room before admitting another patient. Excellent review John. Appreciate the time you have taken to put this posting together. I also had to read the paper and appendices several times to fully interpret the results. Agree with the points in your summary. I question the generalizability of this study. This study examined a particular UV device, placed in one position to cover the patient room and the bathroom and used in selected rooms. The best practice in UV disinfection currently is to use a UV device in multiple positions (once in the bathroom and twice in the patient room) for every discharge on a targeted unit. There are differences in the UV output of different devices and how the devices are used in facilities that are very important and should be considered when discussing UV disinfection. Can you clarify what you are fumigation/ fogging with? It will take a while before UV-C lights to be utilized in every facility. Moreover, many ears are in tune with environmental transmissions yet these facilities fail to process the fact that the first step to understanding the complexities is knowing the extent of how dirty or noncompliant their facilities really are. Most facilities do not want to bring media coverage into their facilities and advertise these findings as well. Administrations also know by tracking C-diff, MRSA, TB, or whatever might bring harm to their facility in some way, so that practice is out. One practice I fell into (by accident) was measuring ATP on surfaces. The fact that bacteria is not visible brought on the use of a UV-B light (I will explain why not UV-A if asked). The UV light allowed me to hone in on visible bacteria colonization for sampling. I did not use the light every time, but only with certain scenarios (there are many). What I discovered was the fact we really never know when transmissions will occur; however, there are some benefits to begin a facility wide approach of sampling the ATP in strategic locations. This device is underestimated to its vast uses. We can actually learn how to track outbreaks with this device. Though the Indians needed years of experience tracking their prey and finding food sources, so too can the ATP meter be utilized as a tracking device. It takes time to master the device and understand the potential measurements that give pandemic type numbers that we can correlate to infectious bacteria, but again, facility admins do not want to bring any liability upon their facility, so the ATP device is a more perfect tool than anything else on the market. It can validate cleanliness. It can track outbreak sources. It can help shed light on individual competencies. It can help validate the effectiveness of the disinfection protocol and terminal clean practices. Hospital staff do not have much time to fret and time involvement is critical. The 15 second ATP test allows one to gather information to be analyzed , documented without much liability concern by admin. This is a huge first step for facilities to be able to understand the monster of uncleanliness they are dealing with. That needs to be absorbed by facilities before any other attempts to work with any other cleaning strategies and technologies.